Let’s take Gov. Larry Hogan at his word: He sincerely wants to make Baltimore’s inadequate bus transportation system better. He’s come up with a plan to achieve that goal, too. The odds, though, are stacked against him. He’s given himself an unrealistically short time frame (June 2017) to totally revamp Baltimore’s complex bus network. He’s underestimated the cost ($135 million) of pulling off such a massive turnaround. He’s got no support from key elected local executives. Much of what he calls for in his plan may not be feasible or sensible. It also might make traffic gridlock worse rather than better. He ignores past sensitivity of Baltimore’s bus riders to major route changes. Resistance to his plan could be strenuous among those who are inconvenienced or will lose convenient access to jobs via bus routes being eliminated. If, indeed, Hogan intends to shrink Baltimore’s bus system to a dozen color-coded routes, his approach could well be “transformative” in shrinking the state’s operating costs. It might make the system less appealing to many riders, too. 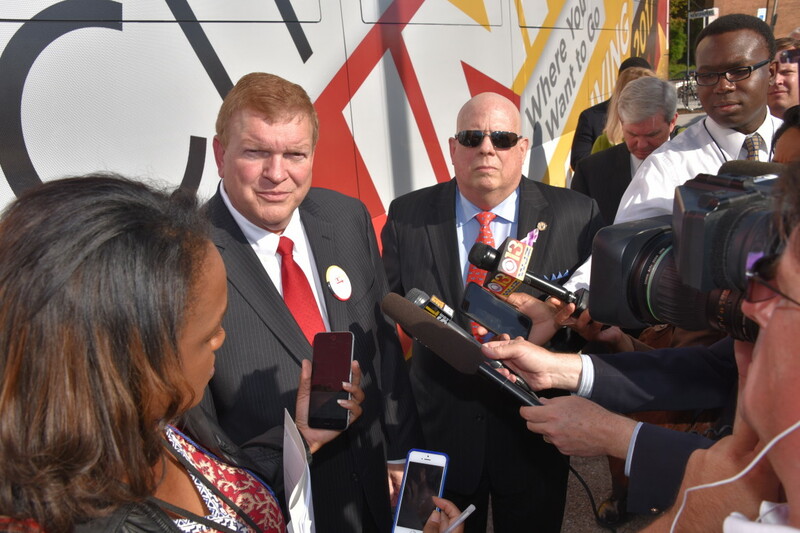 We may not get a good handle on the viability and pros and cons of Hogan’s bus initiative until the state Department of Legislative Services gives the plan a thorough analysis early next year. As is his pattern, Hogan in his announcement excoriated Baltimore’s current transit system in sweeping, negative language. He once again pilloried the rail transit Red Line he killed earlier this year with hot rhetoric that bears little relationship to the facts. Once again, he portrayed his Republican administration riding to the rescue of a mismanaged Democratic city with “transformative” changes. This time, though, Hogan has got to deliver a vastly improved bus system to prove critics wrong. Executing his plan may not be as easy as he made it appear in his announcement. Exactly how will Hogan pull off this transformation without cooperation from Mayor Stephanie Rawlings-Blake over the next 13 months? The two are barely civil and don’t see eye to eye on Baltimore’s people-mover needs. Exactly which north-south and east-west roads does Hogan intend to use for his dedicated, separated bus-only lanes? There are no good options, especially downtown. Such a move would squeeze existing traffic into fewer lanes, making rush hour more of a daily nightmare. Besides, Hogan needs the city to bless such an undertaking, which doesn’t seem likely given the uproar and traffic mess that could result. Exactly how is Hogan going to implement computerized bus signalization to turn red lights green on his 12 new, color-coded bus routes? Every light change commanded by a bus driver will exacerbate traffic tie-ups on the cross street. What happens when buses going north-south and east-west hit the same downtown intersection at the same time in rush hour? There’s a serious question whether Hogan’s signal-change idea will do much to cut travel times. It sounds good on paper but in practice it doesn’t work well. The state and city have been trying to do this along the light-rail route on Howard Street for several decades with minimal success. Hogan will get little opposition and some cheers for other parts of his plan, such as moving bus terminations closer to suburban job centers; extending light-rail hours on Sunday; putting more focus on “last mile” problems for urban dwellers trying to reach their jobs in the suburbs, and giving some financial support to Baltimore’s popular, free Charm City Circulator. It’s now up to Hogan to make his bus transit plan reality. Given the last Republican governor’s muddled attempt to markedly improve Baltimore bus service, there’s considerable room for skepticism that Hogan can pull it off. Here’s hoping he succeeds. The city needs something to go right for a change.